THIS PAGE GIVES A FULL DESCRIPTION OF THE SITE, THE EQUIPMENTS, THE AVAILABLE PROGRAMMES, AND THE DIFFERENT PRICES CURRENTLY APPLICABLE, ALONG WITH A RESERVATION FORM. 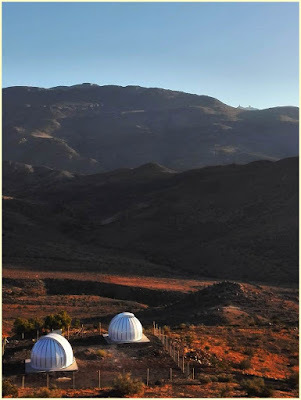 USEFUL INFOS: WHERE ARE THE GREAT SCIENTIFIC OBSERVATORIES IN CHILE? The Observatorio del Pangue stands atop a moderate hill in a mountainous landscape close to the Elqui Valley, located some 480 km (300 mi.) north to the capital city Santiago de Chile. 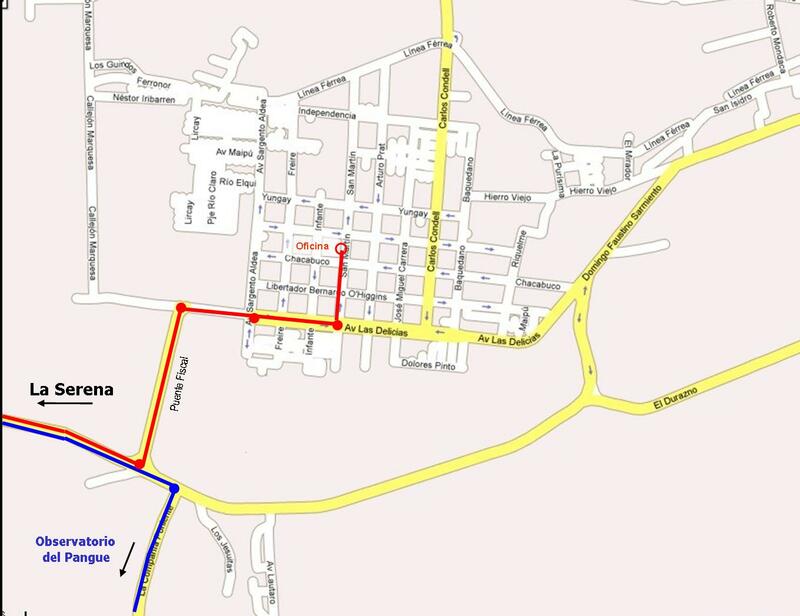 The little town Vicuña is some 17 km (11 mi.) 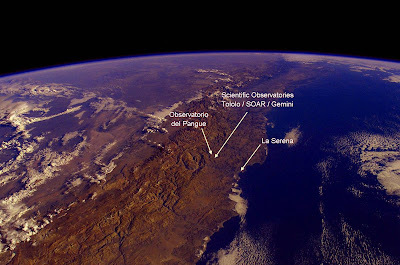 north to the observatory, while the regional cape town, La Serena, is some 80 km (43 mi.) westward. 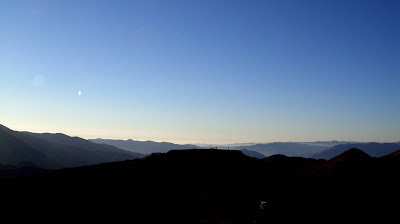 The local view indeed is stunning, where the only human buildings visible in the far are the scientific observatories of SOAR, Gemini, and Tololo, all located within 11 km (7 mi.) to us. Yet the most noticeable feature of the region is the quality of the sky, resulting from a rare association of an adjusted geology, a favourable local climate, and a total absence of light pollution. Hence, these mountains have been selected among 5 candidate places in the world for installing the 500-million dollar budget facility, the next LSST, also 11 km (7 mi.) away from us. 360º panoramic view from the Observatorio del Pangue: the video starts due South West, facing the SOAR and Gemini observatories. 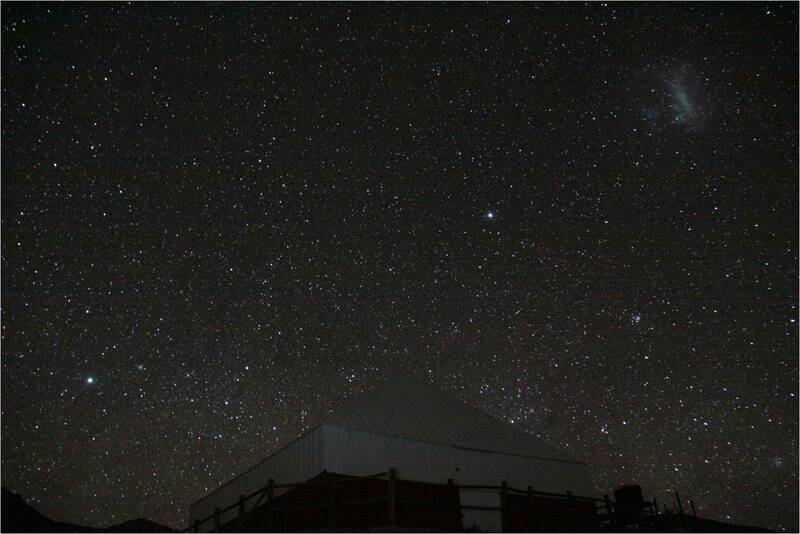 The Tololo observatory, due West, comes into view a few seconds later. Interactive map from GoogleMaps: you can easily find us by playing with the zoom digits and orientation arrows. 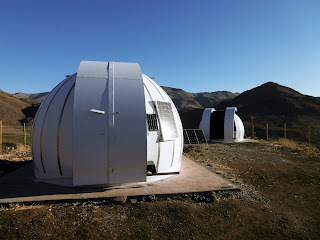 See also the Observatorio del Pangue on the GoogleMaps pages, with the route fully labelled from Vicuña. Our telescopes are equipped with premium eyepieces and accessories, carefully selected, allowing an optimal, effortless sight to any target. 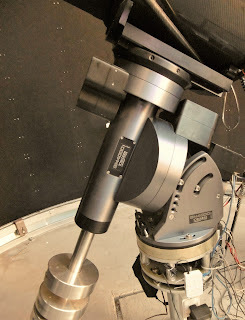 Below, close view on the "10-Micron" italian mount well appreciated for its accurate tracking. aperture 16 inches (40cm), focal ratio f/10. T600: Dobson type reflector OBSESSION, aperture 25 inches (63cm), focal ratio f/5. Specifically intended for high level astrophotography, this is one of the largest public telescope in the world... For the record, the largest public telescope in the world is the 100 inches (2.53m) at the Mount Wilson Observatory, California, famous for being the main instrument used by Edwin Hubble. Below, the T630, next to its rolling roof, ready for one more of the deep sky observing sessions. We propose a series of services, ranging from the traditional 2-hours guided tour, to the loan of the full observatory for complete nights. Here we display the most popular services: for our additional proposals, or for any alternative service you could wish, don't hesitate to ask us. Suitable for the general public, the Program A allows our guests to discover the wonders of the Universe in optimal conditions. 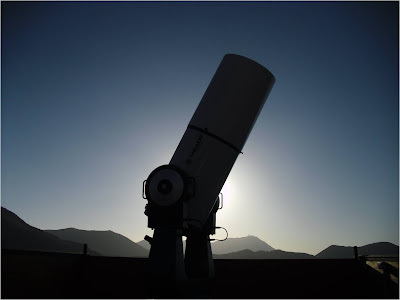 Not only you will observe through state-of-the-art telescopes, but you will deeply understand what you see, thanks to the clever, accurate, and always surprising explainations given by our personnel. 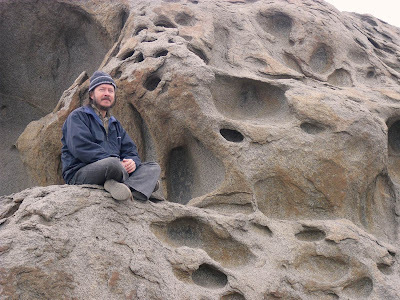 Moreover, any query is welcome, and just every question will be answered, either about the latest astronomy news, or about leading astrophysics topics. Hence, without any previous knowledge in astronomy, you'll be allowed to truly enjoy the endless enchantment of the Universe to which we do belong. The Program A performs with a minimum of 5 people, and a strict maximum of 10 in order to preserve the personalized attention. The group is assisted by 2 astronomers. 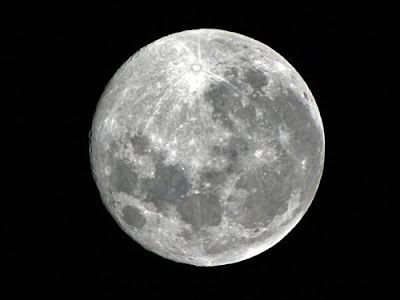 We are open all year, except the nights with excessive moonlight (see "Prices-Booking" page). We admit children over 16 years old only. The available languages are spanish, english, and french. 4. 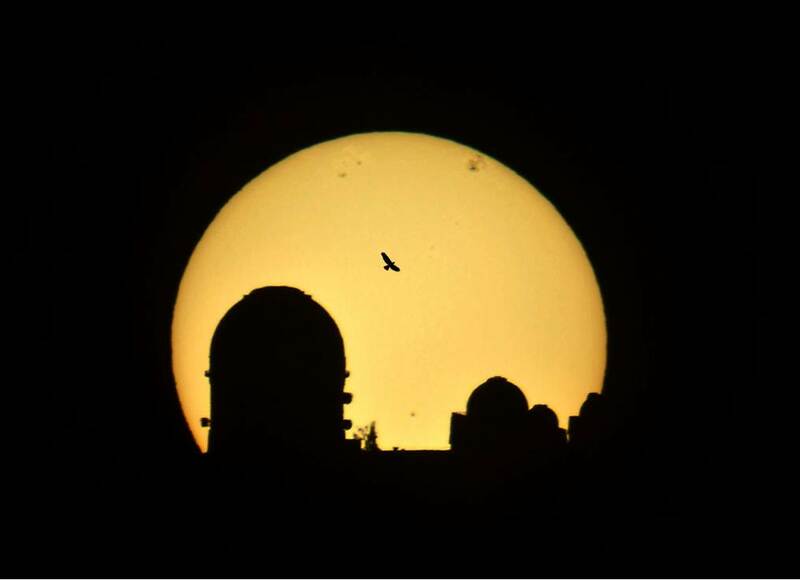 Observing session through the T400 telescope (computarized, 16 inches of aperture). 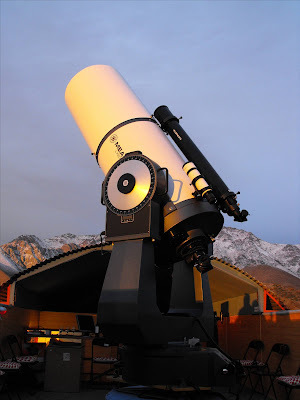 The programme includes all the wonders of the night, such as star clusters, nebulae, galaxies, not forgetting the Moon and planets as available, as well as any specific object you could wish to look at. 5. In the cold nights (which are quite rare...) we offer a hot drinks service in lounge, before the return to Vicuña. The program lasts 2 hours on site (3 hours in total with the transferts from/to Vicuña). The departing time obviously depends on the seasons: in winter (june-july) the tour starts at 18H00 (6:00 pm) local time, while in summer (december-january) it starts at 21H00 (9:00 pm) local time, with the corresponding extrapolated times for the rest of the year. Ocasionally we perform a second tour that starts exactly 2 hours later than the first one. 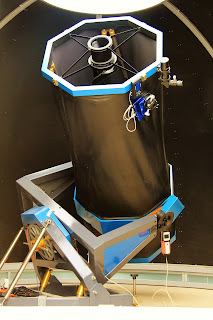 Same as the previous one in its contents and timetable, but with the T600 telescope (25 inches of aperture). The "effort" is worth anyway, since you will discover the stunning deep sky objects such as exotic nebulae or distant galaxy clusters, or even observe the familiar objects but under conditions you never expected to meet. The Program C lasts 2 hours on site (3 hours in total including transfert from/to Vicuña). 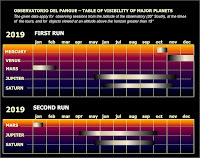 Strictly intended for amateur astronomers, either individuals or groups (clubs and associations), either for visual observations or for performing some astrophotogtaphy. The observers dispose of two telescopes : the T400 and the T600, as well as visual observing and astrophotography accessories, charts, computers, etc... You can follow our observing lists, or perform your own observing programme. In every case, you'll benefit of a permanent technical assistance, and a free access to the cafeteria. This programme lasts 3 hours on site (4 hours in total with the transferts from/to Vicuña). The starting time also is established at the convenience of the group. In case of booking several consecutive nights, a saving price grid is aplicable. 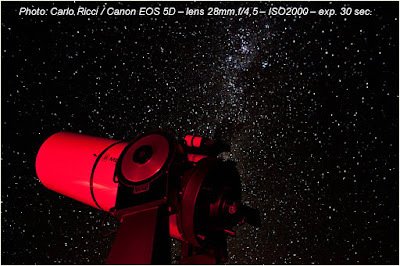 Members of astronomy clubs and associations may also benefit of an additional discount. This programme is exclusively intended for astrophotographers who want to benefit of both optimum sky conditions and convenient location on Earth: from 30° latitude south, the wonders of the Southern Sky are almost always available high above the horizon. Unlike the previous ones, this is not a guided tour: the customers will manage themselves with the equipments we provide, that is the telescope and the usual accessories (CCD, camera adapters, filters,...) They will be alone at the dome, although we remain on site for any help or assistance that may be needed. The session is sheduled for a duration of 4 hours on site. 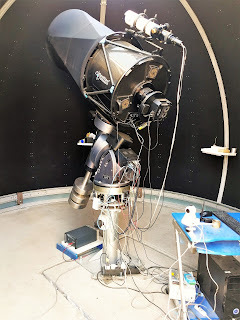 This program, operative since June 2018, includes two telescopes specifically designed for astrophotography: a newton Reginato of 28 inches (71cm) aperture, focal ratio f/3, and an astrograph PlaneWave of 20 inches (50cm) aperture, focal ratio f/6,8. The conditions of use and further details are available on demand. The transfert to the observatory is included in the price. It is recommended to book in advance. Then the reservations must be paid no later than 13H00 (1:00 p.m.) in the day of the Tour, otherwise they are annuled. We accept US dollars and euros with a light surcharge of 2,5%. In case of annulation of the Tour due to adverse weather conditions, we'll refund 100% of the amount paid. The transfert to the observatory is not included in the price. This program is intended for groups managed by national tour operators, or travelling together, who like the benefits of an exclusive service. Similar to the Program A, except for the limiting number of participants, extended to 14 people without extra cost. This program requires a minimum of 2 persons, while the maximum is of 6 persons. Due to logistics requirements, groups over 6 persons must split in two sub groups, performing the programme in two successive runs. In that case the total price is quoted on the basis of CL$ 35.000 per person. If some of the participants are certified members of an astronomy organisation, a 15% discount is applicable to the whole group. Upon reservation only, with a minimum anticipation of 2 days. We request process the payment in that same delay, via bank transfert (ask for conditions). In some particular cases, we do accept payment cash at our agency, no later than 13H00 (1:00 p.m.) in the day of the Tour. Reservations not cancelled in the given delays will be annuled. We accept US dollars and euros (ask for conditions). In case of annulation of the program due to adverse weather conditions, we'll refund 100% of the amount paid. 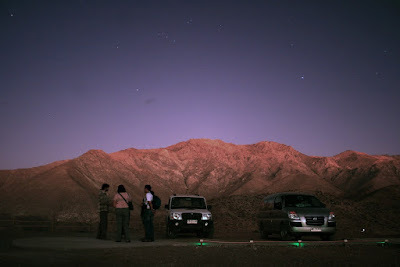 The given price does not include transportation to the observatory, as this program is intended for groups managed by national tour operators, or disposing of their own vehicles. The price is per group, not depending on the number of participants, although it must not exceed 16 people. Due to logistics requirements, groups over 16 people must split in two sub groups, performing the programme in two successive nights. In such a case, the price is CL$770.000 for the whole group. Upon reservation only, with a minimum anticipation of 7 days. Payments must be processed in that delay, through bank transfert (ask for conditions), otherwise the reservation is annuled. Similar to the previous one in terms and contents, except for the reservation delay that comes to 15 days. We propose to our visitors a selection of items that you can reserve and pick up when visiting us. You'll find e.g. exclusive astronomical post cards, as well as high resolution astro pictures taken by our astronomers : check it all here! In case you want some of these, just mention the references in your reservation form, and we'll deliver it to you when you come to register at our office. 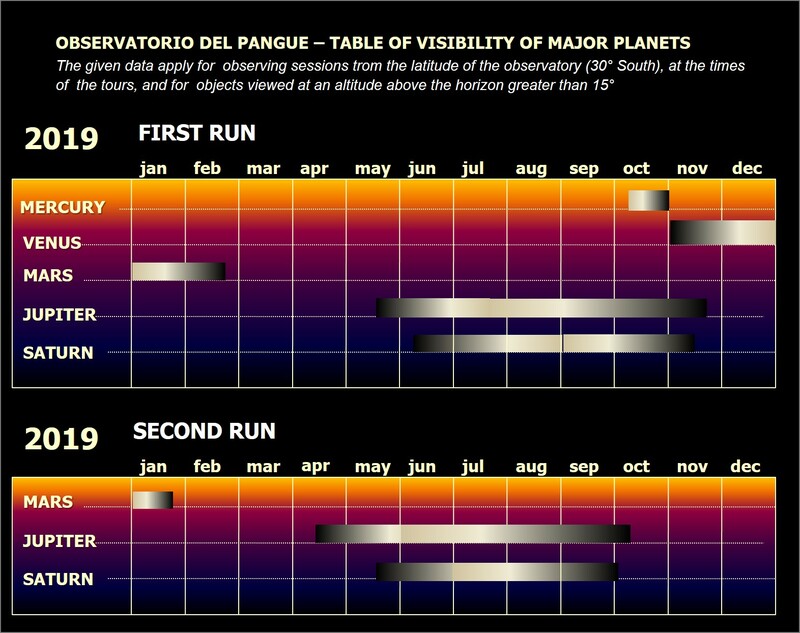 Additionally, we give the periods of visibility for the main planets (click on the table at left to enlarge). 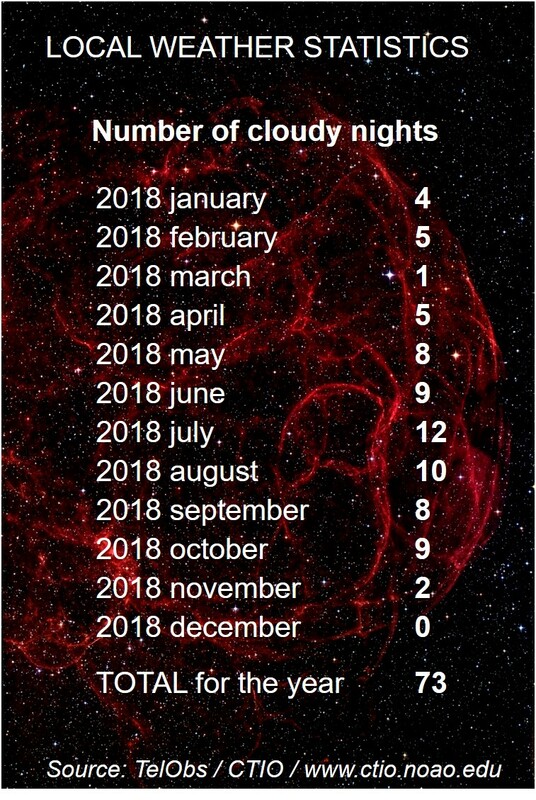 Otherwise, any time of year is worth for astronomy: in summer, good weather conditions are almost guaranteed, but observing sessions begin late (22H00), while in winter, cloudy nights are more frequent but we start much earlier (18H00). The temperature as well is not an issue as we never get excessively cold nights in this area. Remember however that seasons are inverted in the southern hemisphere: winter runs from june to september, and summer from december to march. Then, as to find us, we give below a short description of the road from Santiago to the Observatory, although you may prefer to visualize it by using an interactive map (click here). Air travelling is convenient since there are several flights connecting each day the international airport of Santiago to the airport of La Serena. Surface travelling also is easy, as the "Ruta 5 Norte" is a fast riding highway. Many bus companies reach la Serena every day (the journey lasts some 7 to 8 hours). The "Ruta 41" road is the only choice to reach Vicuña. To get there, you can choose either a bus from the many local companies, or a "colectivo" (collective taxicab). Note however that there is no such public transportation back to La Serena by night. Our office is located in the Plaza de Armas of Vicuña (address San Martin 233), quite close to the "Torre Bauer", the local icon. Times and dates are scheduled according to your flights. 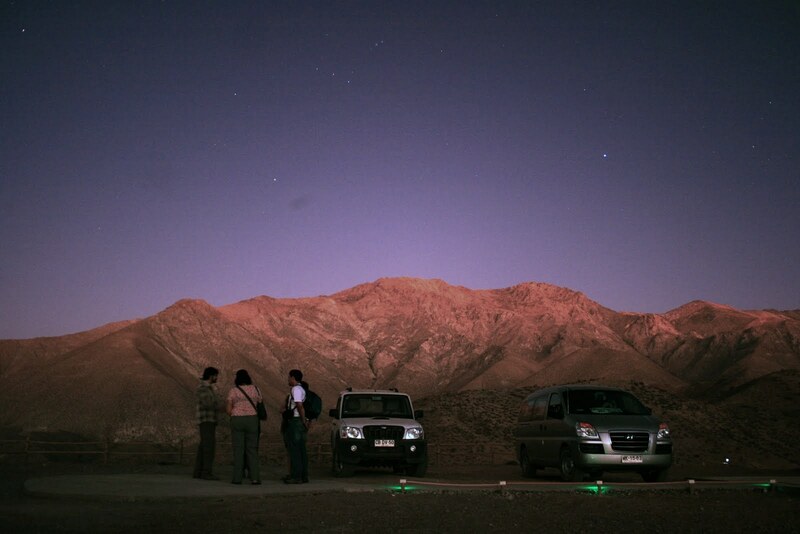 The transfert from Vicuña to the observatory with our van is included in most of our programmes. 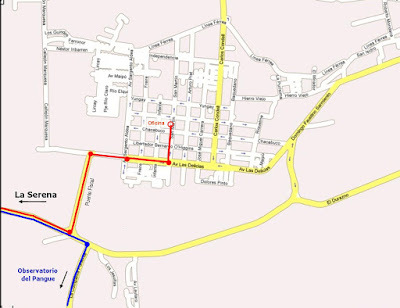 However, if you have to go with your own vehicle, you may leave Vicuña through its southern exit, then reach a few meters ahead the intersection with the "Ruta D445", labelled as “Ruta Antakari”, leading south eventually to the town Hurtado. The entrance of the observatory stands exactly 16 km (10 mi.) from this intersection. The road is suitable for any vehicle (AWD is not necessary), although some steep curves in the last 2 kilometers may require a little care. The transfert at low speed lasts some 25 minutes (30 minutes if coming from the centre of Vicuña). 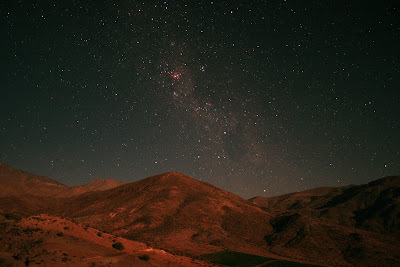 ...somewhere in the Atacama Desert, Chile. 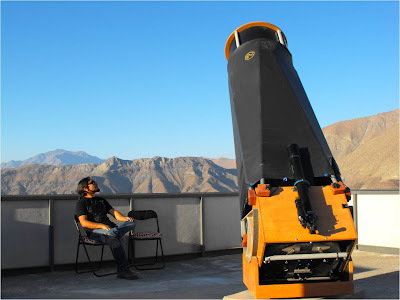 USEFUL INFO : WHERE ARE THE GREAT SCIENTIFIC OBSERVATORIES IN CHILE? It is well known that Chile is hosting the largest number in the world of giant optical telescopes. Good enough for who would like to visit them all, they are concentrated in two areas only, that we present hereafter. Visits are free of charge, although it is required to book a long time in advance. 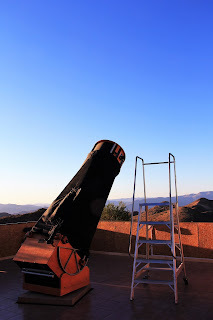 The most recent in the area (2006), hosting a 4-meter diameter class telescope that benefits of high technology (namely adaptative optics), making it more powerful than standard telescopes of the same class. 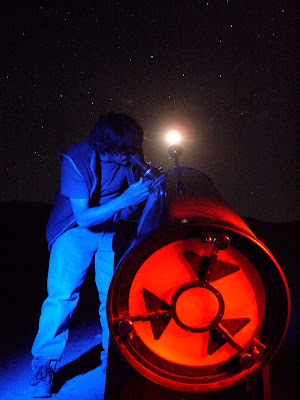 Together with the Tololo, this venerable institution truly started the astrophysics research in Chile. 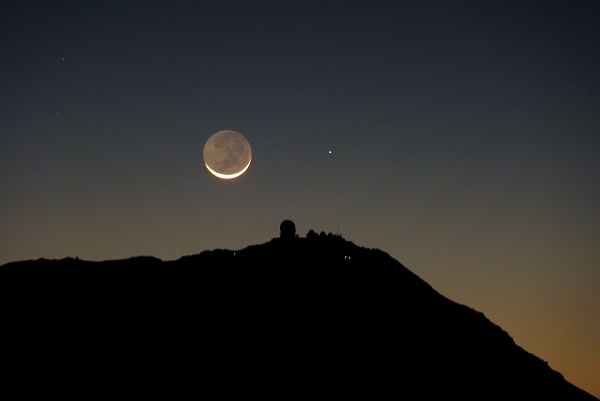 The facility, also known as "La Silla Observatory", hosts several large telescopes. The main one, a 3.6-meter diameter class, looks rather "small" for the current standards, but fitted with state-of-the-art technology it still delivers premium scientific results, particularly in the field of detection of exo-planets. Scheduled for completion in 2020, we reach here a much higher level, as this is a 24-meter diameter class telescope ! The site is within the domain of Las Campanas Observatory. Also referred as "Parranal Observatory", this facility belongs to the ESO (like La Silla). It holds, among others, a series of four 8-meter diameter class telescopes. Since 1998 they produced a huge amount of scientific discoveries. Scheduled for completion in 2022, this telescope will remain the largest in the world for long, as this is a 39-meter diameter class instrument ! 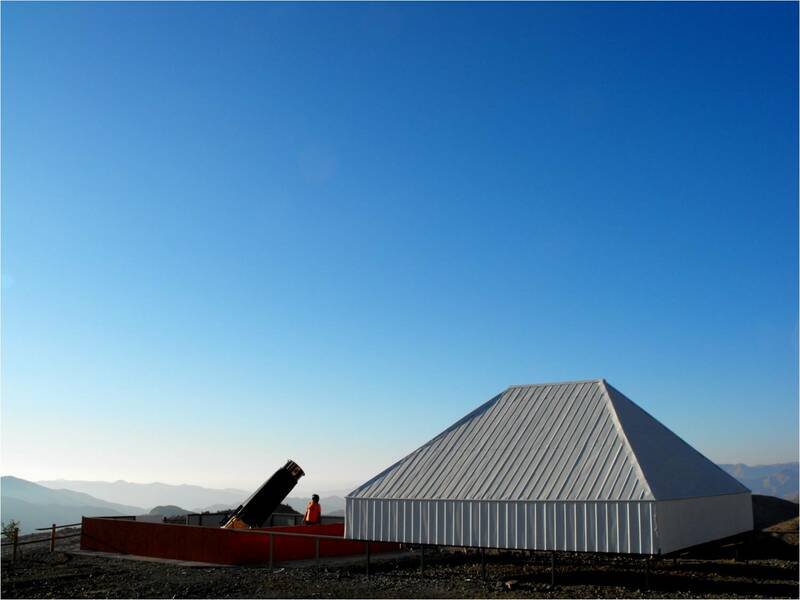 It stands on top of Cerro Armazones, a "hill" facing the Parranal Observatory, from where the ongoing works can be seen. Operative since 2014, this very large array of 65 parabolic dishes is spread over the altiplano of Chajnantor, some 80km (50 mi.) 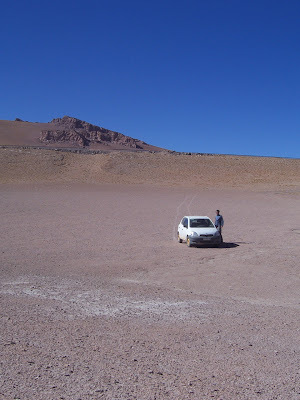 south to San Pedro de Atacama. 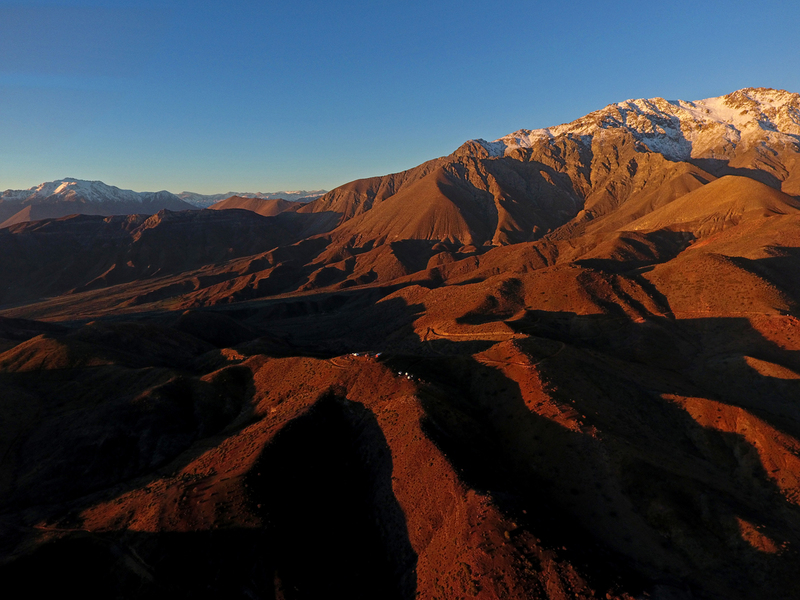 Potential visitors must be aware that the entire site is located over 5,000 meters (15,000 feet) above sea level!